If you are a business owner, correct and proper waste management has never been so important. In the past, waste was seen as a necessary by-product of production, but it has now become one of the biggest global, economic, social and scientific challenges of all time. The waste hierarchy (above) is one tool that’s been used to examine ways of reducing post-production waste. Through prevention and minimisation, the hierarchy has been effective in reducing post-production waste, but has proved to be costly. For many companies this costly approach has stopped them from using the system, and ultimately reducing their waste. 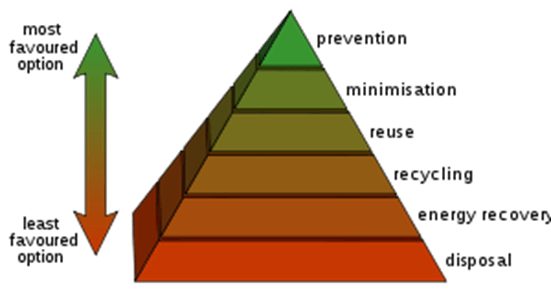 Prevention is the most favoured option as not only can it save businesses money, but it also is the easiest option in the long run. Disposal is the least favourite option because it can look less organised for a business and isn’t as much of a sustainable option as preventing waste. It’s clear that a new approach is needed. Companies need to be able to reduce waste, but in an economical way. The term ‘Circular Economy’ means an industrial economy that is designed to be restorative – i.e. many of the aspects of manufacturing that are thought of as waste, actually become thought of as a useable by-product. The Circular Economy looks at materials in two categories: biological and technical. Each of these materials move through the system differently – biological materials re-enter the biosphere safely, whilst technical materials circulate in the system indefinitely without entering the biosphere. Take a look at the infographic below for an overview of this process. The Circular Economy system results in very little landfill. By re-using, refurbishing, and recycling materials as commonplace, the cost of materials is also reduced. 1. Economic – Improving economic efficiency through the means of resource use, treatment and disposal and creating markets for recyclable products can lead to efficient practices in the production and consumption of products and materials resulting in valuable materials being recovered for reuse and the potential for new jobs and new business opportunities. 2. Social – By reducing adverse impacts on health by proper waste management practices, the resulting consequences are more appealing settlements. Better social advantages can lead to new sources of employment and potentially lifting communities out of poverty especially in some of the developing poorer countries and cities. 3. Environmental – Reducing or eliminating adverse impacts on the environmental environment through reducing, reusing and recycling, and minimizing resource extraction can provide improved air and water quality and help in the reduction of greenhouse emissions. 4. Inter-generational Equity – Following effective waste management practices can provide subsequent generations a more robust economy, a fairer and more inclusive society and a cleaner environment. 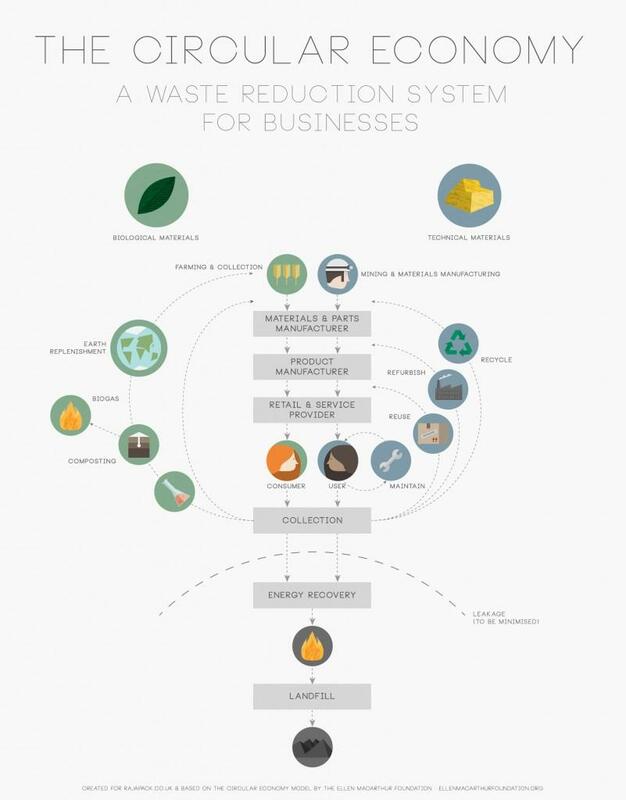 A Circular Economy is not only designed to accommodate every single one of these points, but it can reduce your business waste and your costs too. By implementing a Circular Economy system that focuses on reducing pre-production waste, you’ll cut post-production waste and so reduce your business’ impact on the environment while improving your bottom line. 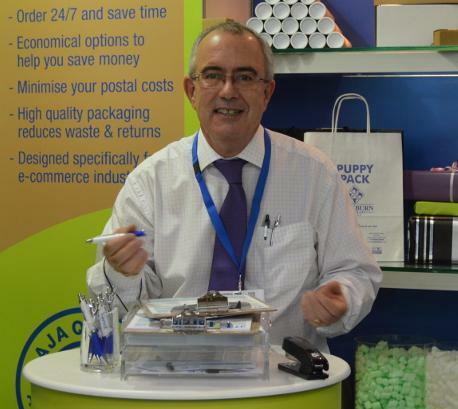 Simon Howes (Head of Logistics) at Rajapack UK states: “The issue of waste recycling is at the forefront of government and local authority priorities, simply getting rid of waste in landfills is not good enough. Waste prevention is based on a simple concept. If you create less waste, you consume fewer resources and you will have to spend less effort (e.g. money, energy) to recycle or dispose of your waste”. Simon went on to say that “Ignoring waste recycling potentially incurs loss”. “With cardboard and plastic rates at a high, there are obvious rewards for recycling waste”. This entry was posted in Packaging Products & Materials and tagged business, circular economy, waste, waste management on October 28, 2014 by Rajapack. Graham Williams has worked for Rajapack for just over a year covering South London, Kent, Surrey, East and West Sussex and Hampshire. Graham has over 25 years of sales and contract management experience in print and packaging. Outside of work Graham is active in coaching his younger son’s Under 13 football team, off-road cycling and gardening. Here he describes a typical day in the life of a Rajapack Field Sales Executive. This entry was posted in Packaging Industry News on October 24, 2014 by Rajapack.